Every NRA Instructor Candidate must take the NRA Basic Instructor Training (BIT) once in their career as an NRA certified instructor. This course is designed to introduce and educate the candidate in the NRA methods and principles of training, course management and doing it the NRA way. 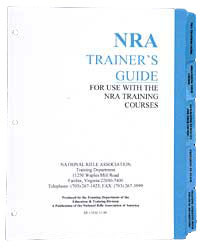 The NRA requires its material be taught using a specific methodology and techniques and this course educates the candidate to them. The NRA has specific material usage and administrative reporting requirements that a certified instructor must follow and the candidate learns about these. Through the use of lecture, role playing and in-class exercises the candidate has the opportunity to apply these during this course. and finally preparing to teach. At the end of this course, there is a written examination that the candidate must pass with a ninety (90%) percent or better grade. Demonstration of proper attitude as evaluated by the Training Counselor(s) delivering the course is a crucial component of passing the class. Previous training in the NRA Law Enforcement Education Program (LEEP), NRA Certified Range Officer training, POST certification, military instructor training or other instructor certification cannot be used to replace this requirement. This course price is all inclusive for all course materials and instructional aids. Additional cost are only for NRA certification fees. We provide you two options at enrollment time for payment, pay in full or only make a deposit. Payments are non-refundable, but if you are unable to make a course, it will be credited fully to a course at a future date. No Classes are currently scheduled. Please call 970-619-8154 or email us at Info@TallGuns.com to inquire about scheduling a course.